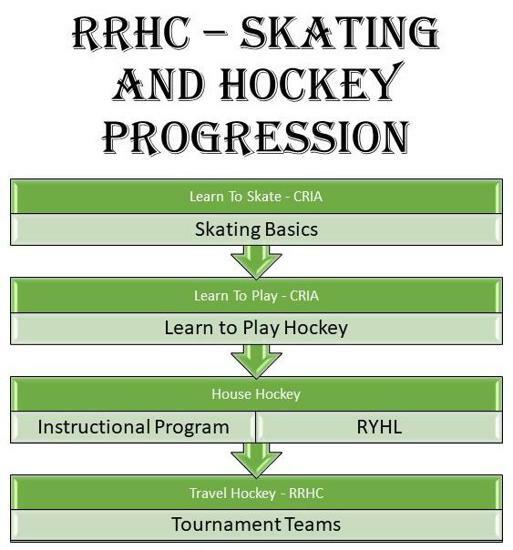 RRHC offers an Instructional Program (IP), which consist of 6-8 weeks of Instructional Program hockey that will skate twice per week schedule permitting. The practices will occur twice per week (as ice availability allows) with Hockey Director, Dustin Timm, leading the development of the players supplemented by willing volunteer coaches! This is a USA Hockey sanctioned program, and all volunteer coaches must go through appropriate registration and certification. Practices will consist of FUNdementals such as skating, pucks skills, and a healthy dose of small area games that incorporate hockey concepts. There will be two groups within the Instructional Program (Platinum & Gold). Both groups will skate on the days below. Note: depending upon registrant numbers IP sessions may be combined to the earlier time. *Early bird registration through April 23, 2019 for combo of RYHL & IP only $105. *Late registration fees start April 24, 2019. IP - $70 & RYHL/IP $135. In RRHC we want to provide an opportunity for all of our players to play goalie if they would like an opportunity. Below is the schedule for goalies in the Instructional Program. The first day of the session we will not have any goalies as it is important that the coaching staff has an opportunity to ensure every player is placed in the correct developmental group. New to Hockey? Have a Question? Contact Dustin today!